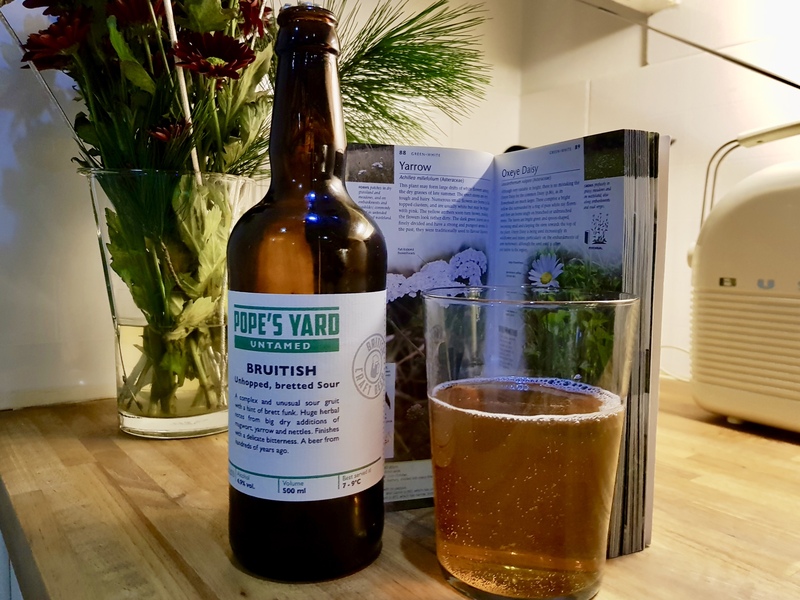 five Hertfordshire beers – MostlyAboutBeer……..
On the British psyche, Hertfordshire doesn’t really summon up a region known for beer. In fact, the county itself even isn’t mapped on the radar for many. I’ve heard this question asked by someone who was brought up in Essex – the county that borders Hertfordshire’s eastern flank! But it’s a common blindspot; most people don’t know where Hertfordshire is (even in London – just below it), but everyone knows where Essex is. To commemorate Tryanuary and try and raise the profile of Hertfordshire, I’m selecting five beers from five Hertfordshire breweries. I’ve tried to make them diverse. From the comfort of the traditional to the bracing of the unknown, here are my five beers everyone should try from the land of the hart rampant. This comes first as it’s the oldest beer on the list and offers us a glimpse into the past. Even its title tells a tale. Many breweries used to have an AK in their rosta, but McMullen is the only one extant. Nobody is sure what AK chalked onto casks actually stood for, but these two recent posts by beer historian Gary Gilman give some context. AK was first brewed 186 years ago and has stayed exactly where it was whilst the rest of the world went ever more verdant and hop-forward. This most genteel of ales is made with Whitbread Goldings Variety and for me, is like the beery equivalent of cereal with raisins. To push the analogy further – you get that sated porridge feeling after a couple of pints too. 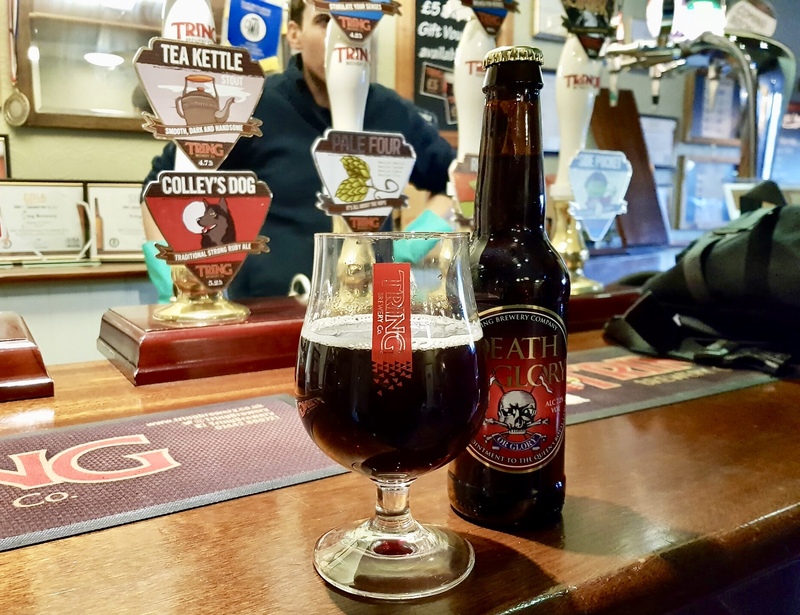 It comes from a time when ale wasn’t about overwhelming the senses but sustenance, and has had two centuries to balance out its wrinkles to get itself just right. But as with most cask ales, it does need to be served in good condition to appreciate. It started off life billed as a light mild. The brewery retitled it as a bitter (though the beer itself wasn’t changed) to appeal to more contemporary tastes. 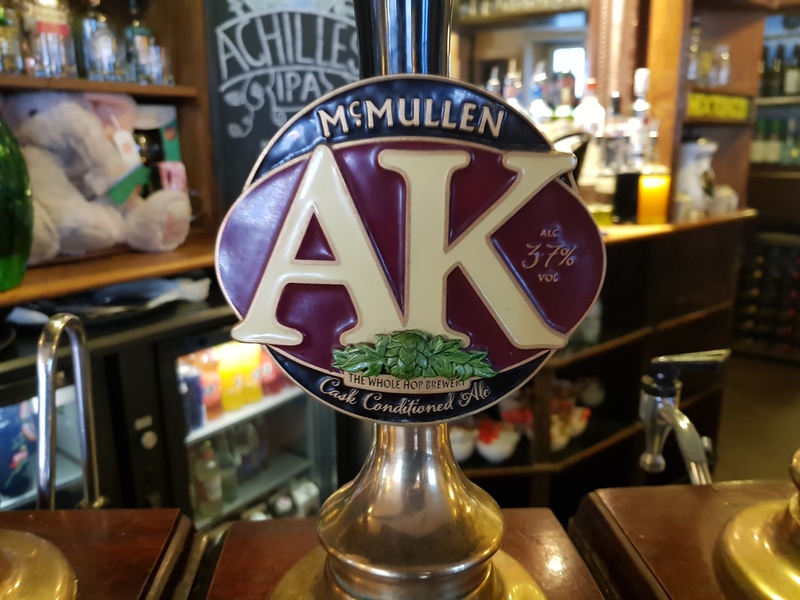 Now we’re in 2019, the term bitter is gradually dropping from the lexicon and I wonder whether I’ll soon read ‘AK Ruby Ale’ or ‘AK Dark’ on the pump clip instead. It’s a pint that expects you’ll be ordering another after it because that’s how it works – the slow accretion of malt nourishment. It’s an ale that grows on the palate – genuinely different from modern beers and worth spending time with. Best drunk from a pub. Brewed only during the months that mugwort, nettles and yarrow grow – all plants that have been used in brewing since long before those lupulin flower heads ever got a look in. This ale (based on well-employed definitions, I can’t call it a beer as it doesn’t contain hops), is copper/bronze in colour and doesn’t build up a head. On the sip it’s tangy – prickly, even. It reeks of a wet hedgerow. It has a white wine vinegar and tonic water aroma. There’s the nettle sting and in my mind, the burdock leaf balm too. There’s a brandy fug and the green hit of chlorophyl. Is there a note of gin or is the association there because of – if you’ll allow the repetition – association? Those green vegetal ribbons, faggots and slices that are increasingly infused into glasses of that spirit in every bar now. There’s also the sensation of vicing a sweet pickled onion in your wisdom teeth before chomping on it like a grape and experiencing the juices baptise the gullet. This would go great with a rich cheese – it would cut right through it. This is no sessioning ale but a palate cleanser and forces the drinker to try and come up with a new vocabulary just to describe it. It’s a bit like champagne’s truculent cousin and has the same puckering dryness. London Porter consumes the light. It spills no secrets – obsidian to the eye. Only the reflection of your own furrowed brows can be discerened on the glass against this blackdrop. It’s cool on the sip. It’s the refreshment you thirst for, but the cold you hunger after. It’s full of smoke and coffee and leaves a lacquer on the palate. You’re assaulted by the aroma of a cocoa tin levered open to the point you can feel the metal rim under your nails and the sweet chocolate powder nimbus billowing out into the atmosphere. First you get the brawn, then the elegance is delivered as it slips down like silk. This is down to the addition of wheat in the grain bill along with four other kinds of malt. London porter is one of Mad Squirrel’s breadwinners. It’s also one of the first porters I ever consciously drank as I entered beer nerdery over a decade ago. This has been one of my favourite beers for a long time and I’ve watched the gradual evolution of the squirrel itself. That slight mammal used to bound gayly across the livery but now stares back at me in certified contemplation. 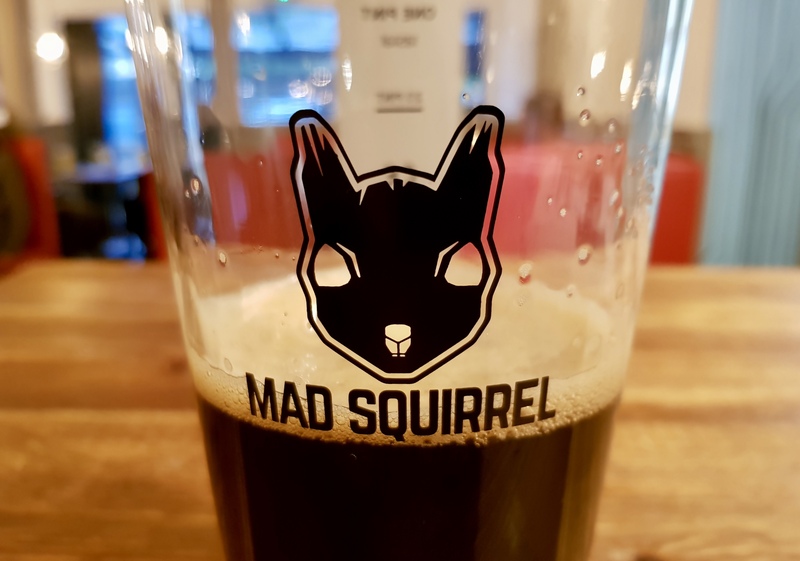 As an added bonus, if you drink it out of a branded glass, this psychotic rodent gradually emerges from the blackness as the beer level sinks. 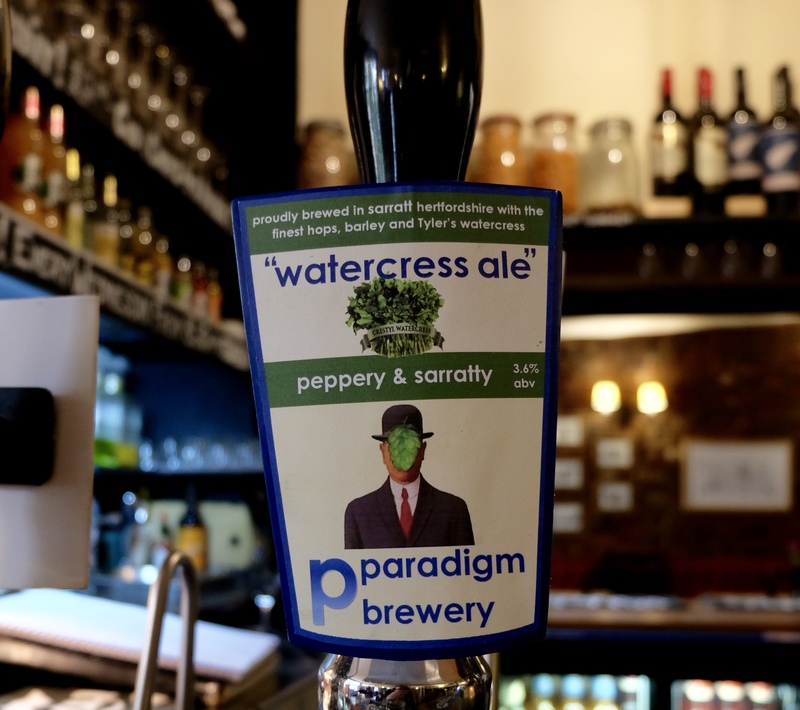 Here’s an ale with an extra element that divides customers: watercress. This ale – like the Bruitish is brewed seasonally. Freshly harvested watercress is nothing like the tiny shoots that sprout from the sponge rectangle in those little plastic supermarket containers. The real deal has fronds a couple of feet long. If you bite into them, the heat increases until it feels like your head’s reverberating from a blow. The iron is palpable too – wasabi delivered by hammer strike. This beer links into the local landscape and the vestiges of one of Hertfordshire’s old industries: watercress farms. Rivers like the Ver, Mimram and Chess were tame and shallow enough to cultivate acres of watercress plants. The produce was sold in places like Covent Garden and served in a small bouquet to be eaten a bit like a cornetto. The echo of this trade can still be discerned along those rivers where the plant often clogs the watercourses like triffids where the channels narrow. Five kilograms of watercress go into a 550 litre volume of beer. This is enough to cause the drinker to take notice but thankfully, not enough to overwhelm. On the palate, there are sparks of green and blue in there amidst the chorus of orange and pink – that’s the synesthesia of my drinking recollection. This is a beer you roll around the tongue. You get a subdued pepper note at the end. This ale would suit those of us that don’t care for the potency of chilli beer but can appreciate a touch of sweet mustard with our daily bread. Finally, the legend that is Death or Glory. I’ve waited until the end as it serves as our nightcap. There are only a handful of long-running cask strong ales/barley wines across Britain and this is Hertfordshire’s. 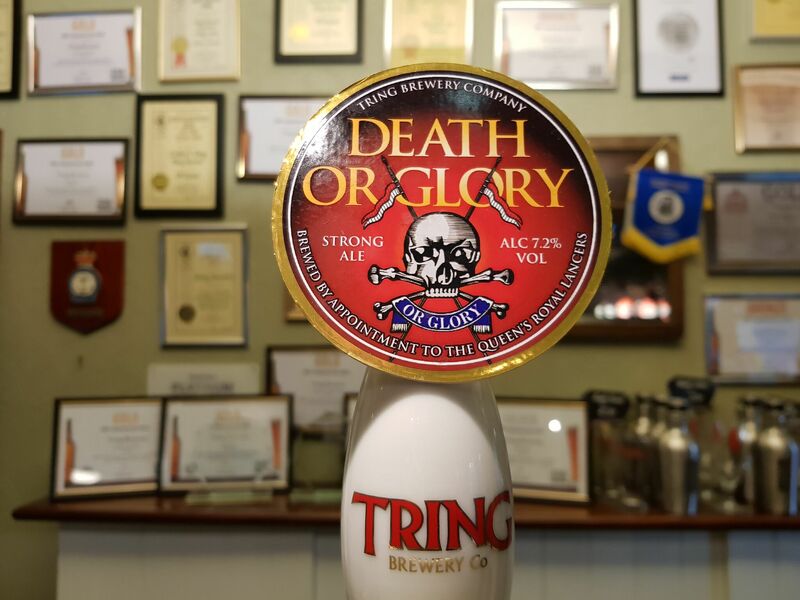 Tring Brewery was founded in 1992 and Death or Glory was first brewed in 1994, so celebrates its quarter century this year. It’s a 7.2 abv beer traditionally brewed on 25th October to commemorate the charge of the Light Brigade but is now produced numerous times a year to keep up with demand and showcases Styrian and Challenger hops and Maris Otter, Crystal and Chocolate malt. When it does the rounds across the beer engines of Hertfordshire, the firkin can be completely emptied by the pub-goers on the day of tapping. I’ve witnessed the Death or Glory whisper going around the pubs of St Albans before. You usually have to be quick to score some, and like many heavy beers, you don’t order a pint but a half followed by a second (that unbeatable topers’ logic). It reflects the climate of the colder months when it would be most welcome; the conserves and the pickling. This has the taste of jams and chutneys, nods to brown sauce and Worcester sauce. On the eye it’s like dark treacle. The aroma is of tar, stewed red fruit, polished wood and bitumen. The palate reflects notes of black cherries, dandelion and burdock, iodine, molasses or brown sugar and that funfair staple – candied apples encased in a caramel amber. It laminates the tongue and inner maw. It’s everything in all directions with the fruity hops in there somewhere clinging to flotsam in the maelstrom. It goes sweet, sickly sweet then bitter and retraces this circuit. What was noteworthy when it was first made is that it was aged – a process given to few beers at the time. It’s always matured for a month before release. An excellent selection – some of my favourite beers from those particular breweries too.